You know I love simple crafts. I mean, less time spent doing projects around the house means time for more important things like watching Downton Abbey. I’m busy worrying about Lady Sybil’s baby, the fate of Bates, and what’s going to happen when Thomas keeps making unwelcome advances towards Jimmy the footman! Sorry to go off on a tangent – now let’s get back to reality. Remember my thrift shop find? She was a beauty with her cranberry glass but she needed a hat as fancy as her party dress. I’m no Hoda & Kathie Lee but I must say I gave this gal a mean makeover. Ready to remove your blindfold and be dazzled? 4) Turn on the light and admire your one of a kind lamp! Throw her a compliment or two – she’s not used to all this attention. Perfect! They look like they were made for each other all along. You did a beautiful job. Oh, I love this look! Would the heat from the lamp affect the paint eventually, do you think? I’ve got a couple of plain jane lampshades this would be perfect for! love this! 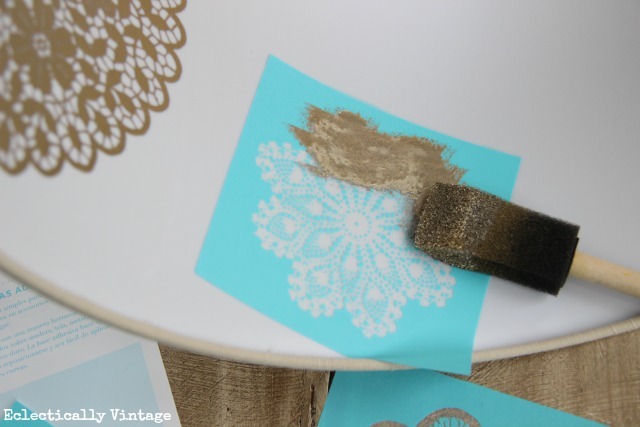 love the stencil you used and the gold! Kelly, she is stunning in her new hat. Beautiful! I would never have thought of doing it on the inside of the shade, but it makes sense. WOW!!! How easy and beautiful! Adorable! What a great looking lamp – just love it.. and I also love Downton Abbey! Love it! It looks very anthro-esque! Great finishing touch! 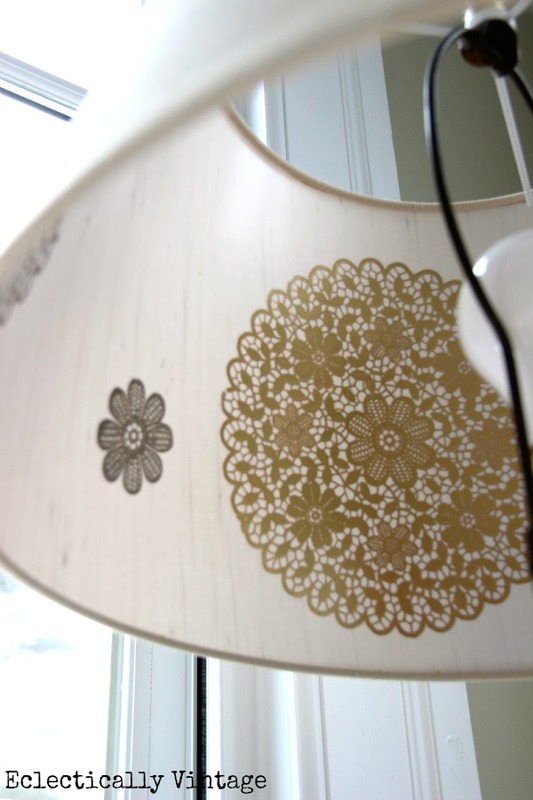 I’ve been thinking about stenciling a shade, but on the outside. When your light isn’t on, does much of the stencil pattern show thru or is the peep show only with the light lit? Love this shade! It’s so simple, but really elegant! I’ll have to remember this for sure! Brilliant idea. That lady is now strutting her stuff! I love it. Oh my, Downton Abbey’s my favorite show and I can’t wait for it to come on every Sunday night! I, too, am wondering about Lady Sybil’s sweet “Little Lady Sybil.” I wonder if something is going to happen so that Lady Mary and Matthew Crawley end up taking care of her. Maybe?? As for Thomas, I think he’s getting ready to get what is due him from Jimmy(uh, James). I think Bates will be back acting as valet for Lord Grantham again. So much to think about! Just beautiful! Great job, I love the way she turned out!!! 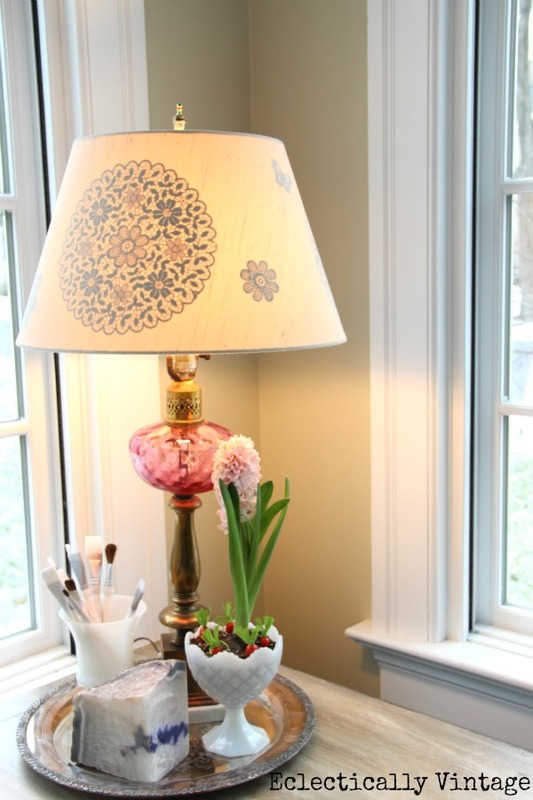 I love that lamp and the lampshade is a beautiful addition; just what it needed. may have to try that on a small lampshade. I have never seen it done like you did; I have seen where someone painted inside of shade with a glittery paint. Great job! The lamp is such a pretty find. The color is exquisite!! Oh… and DA is getting le juicy! Loved the little bug Sideburns put in Thomas’s ear about his little friend. hehe. Next Sunday should be GOOD! That lamp is adorable! Hmmm. Was going to change out some lampshades, but this looks I might not have to replace them… 🙂 Thank you for the idea! That lampshade is so cute, you have some great ideas. Thank you for sharing!! Love it, my daughter wants a lampshade with butterflies on it maybe this would be a way to do it…thanks for the great inspiration as always! You are so funny … and brilliant! I love this and am gazing around at several lampshades that would love a little attention, too! Thanks for the inspiration! This is right up my alley! I love it Kelly. I love the lampshade! I have a few blank lampshades that need Downton Abbey inspiration! Super cute. She’s awfully pretty! Well. as Tom Jones would say, “She’s A Lady”…. 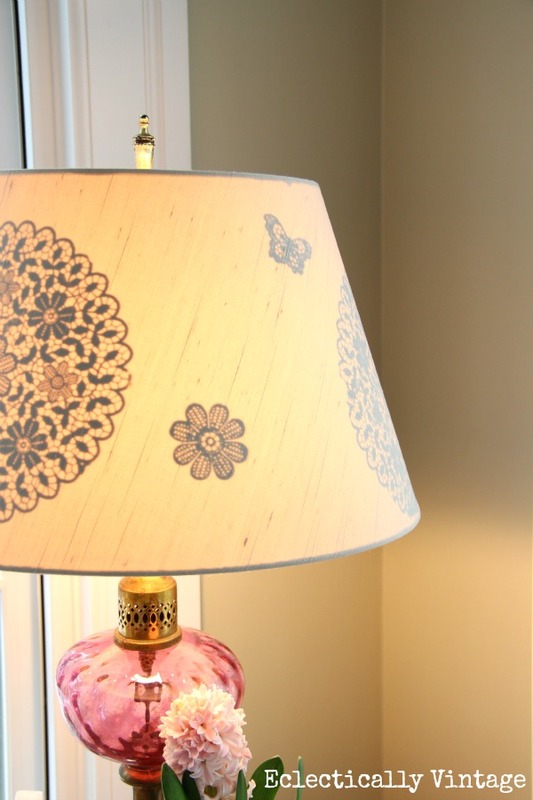 I love it….just the perfect shade for that gorgeous lamp…! I love the lamp and what you did with the shade! Beautiful! I just covered a damaged shade with a crocheted doily, a dresser scarf and I think it’s cool. 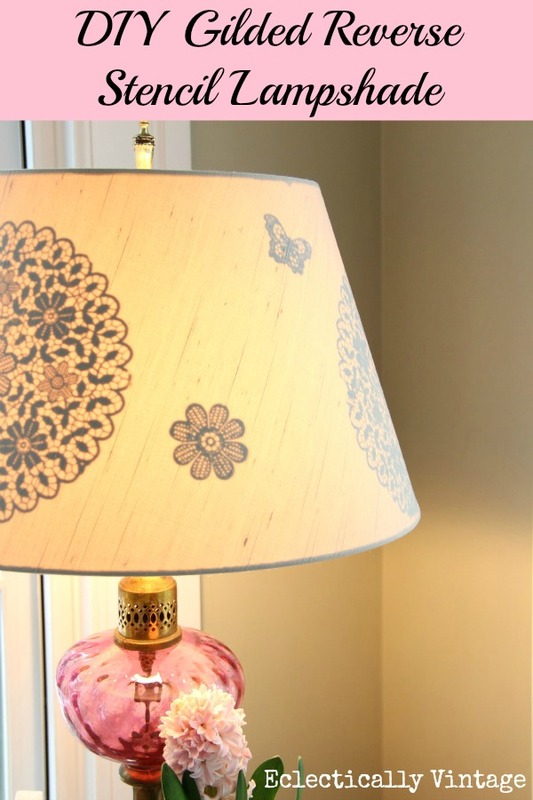 I would love to try a stenciled one like yours if I had a lampshade in good condition! I love your brilliant ideas! Happy Valentine’s Day! Gorgeous! But what is self-adhesive silk screen? The link only brought me back to the blog. Thanks! Oh my gosh!! That is absolutely beautiful! I would have never though to do that on the inside of the shade!!! Thank you so much for the inspiration!! I have some lamp shades that could benefit form that treatment. Very pretty project! I love the part about “she’s blushing.” I love your writing! How cool is this??? I truly was just thinking after this last Paris Flea sale that I needed some fresh ideas for old lamp shades. Pinning this, and trying this out for the next sale. Thanks! I am really worried about Lady Sybil’s baby too. Not that she will be christened a Catholic, but who will raise her, and how???? Super impressed! Thanks for sharing and linking up to Monday Funday! I seldom comment, but I read some of the comments here She’s a Beauty – Gilded Lampshade Project – Eclectically Vintage. images and videos, this blog could undeniably be one of the best in its field. You did an amazing job with your lamp shade. I have always liked Fenton lamps, especially the cranberry. Great find! thank you – it’s a fun color!